Cob Jockey: Lesson Wrap-Up: More Cavaletti! Let me start out with a still from last night's lesson that gives me ALL THE HEART EYES. My horse has never looked like this in a canter still before! For my lesson on Tuesday, I told my trainer I would like to use poles to help adjust the canter. She came out firing with two exercises. The first one was the circle of death, and she made it even harder by evenly spacing the poles but asking us to do 4 strides, then 5 strides, then 4 strides, then 5 strides. We were not very good at this at first, and started out not showing a whole lot of difference. Then my trainer said, (very much paraphrased) "cowboy up and make the 4 happen or else". And we got it - plus some overachieving ground pole jumping when we took a long spot, and also a lovely (for us, for now) completely accidental counter canter. After we'd started to show some improvement and differences in the top exercise, we moved on to the second exercise. She had tiny verticals set up roughly near H and F, with ground poles an easy 4 strides in front of the fence. She told me to go around the outside of the ring, taking the H line in 5 and the F line in 3. The five though, we struggled with. We stopped doing the three since clearly he got the message there, and spent the last few minutes working on the five. 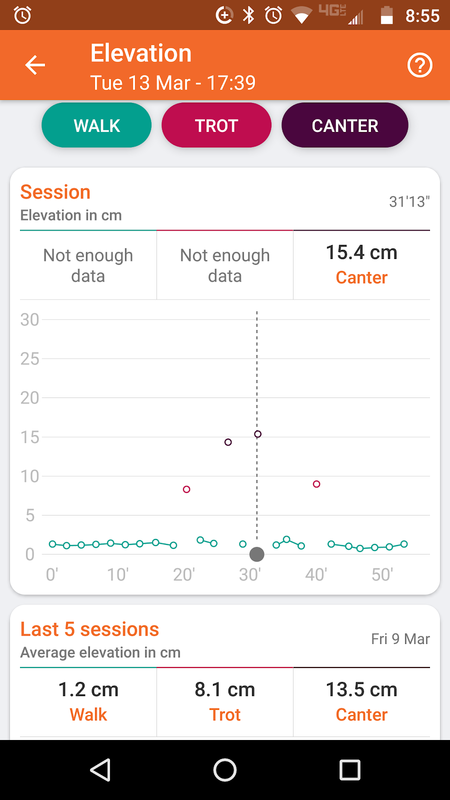 This is not surprising, since shortening his stride in the canter is the most difficult thing in the world for me in general. 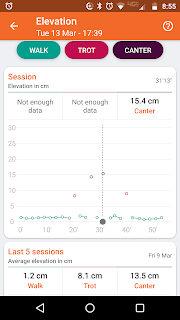 That is NOT an average but a point-in-time snapshot of canter front end elevation, BUT 15.4cm is the highest front end elevation he's ever registered at the canter, by about 1 cm. 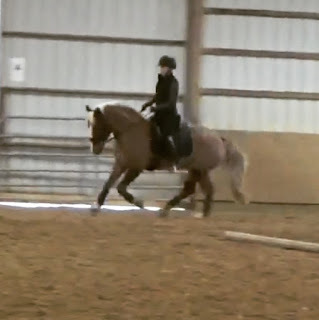 My trainer had me think canter pirouette when I picked it up, and that plus really thinking about putting my shoulders on top of my chest helped us finally nail the five. As soon as I pulled him up I gave him pats and a long rein, to tell him he finally gave me the right answer, and we quit there. It wasn't perfect on either of our parts, but we finally shortened his stride. I'm not sure which one of us is going to be more sore or tired after this lesson! All this cantering and my new position has my back really sore. One way or another, today is a well-deserved rest day after three great rides in a row and two involving cavaletti. Good pony! You guys are looking SO amazing! We’re stuck in canter flailing pergatory right now especially with my lack of rides recently but that’s my focus for the next couple of months.